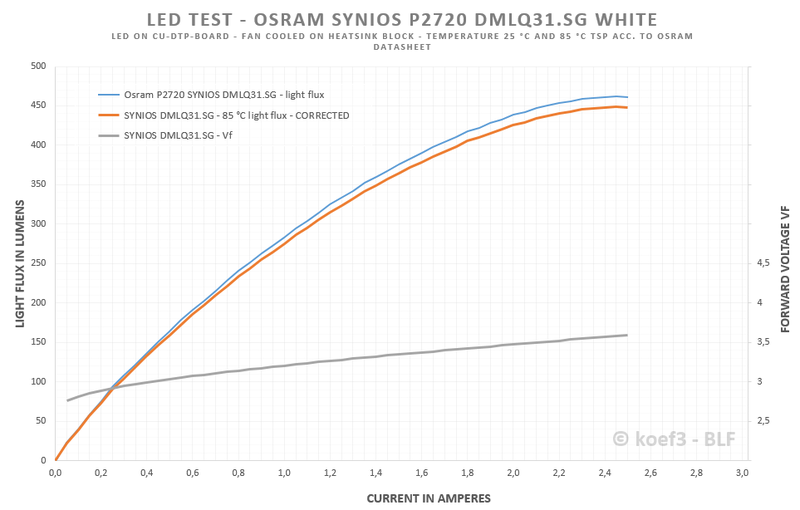 LED test / review Osram SYNIOS P2720 DMLQ31.SG white - Small chip, but big in luminance - at low current! 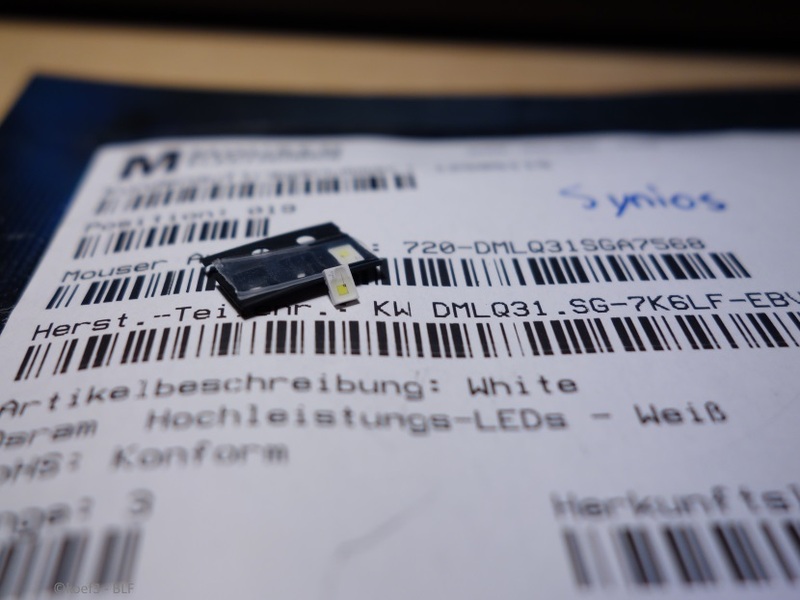 A few months ago in the german TLF I wrote about an interesting LED series, manufactured by Osram: the SYNIOS P2720. There are some types available, all in same footprint but different die sizes and colors. In August 2017 I already tested the SYNIOS P2720 DMLN31.SG. This test is outdated, in addition the luminance values stated there are totally wrong (details to my new testing method in this test under 'Luminance'). Important hint for all those BLF members which are active in the german forum too: I’m not longer active in the german forum (TLF) anymore. Despite my currently not so good English I will publish my upcoming tests only in this forum (BLF). I purchased the emitter at Mouser a few months ago. 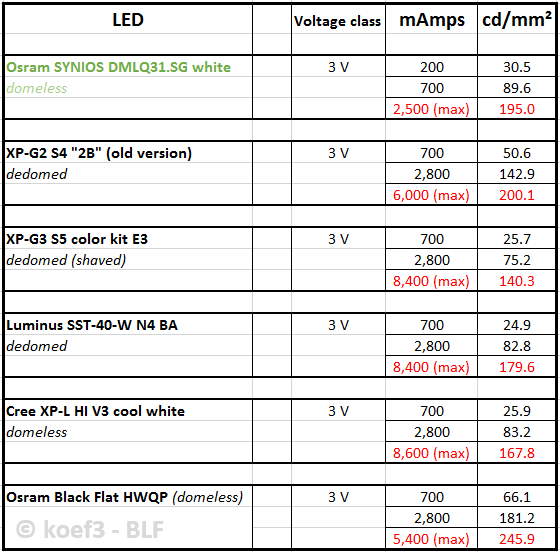 Official datasheet is available here (Osram website, pdf). Like the other LEDs of the SYNIOS series the dimensions are typ. 2,75 x 2,00 mm (0,108 x 0,0788 in). This enables lower development costs and better customizing of accessoires using this LED. In general, this LED is intended for use in automotive and cycling light. Because of this unusual size Osram uses a special footprint, which is not fitting on industry-standard PCBs (XP/XM layout) directly. The housing is made of white epoxy resin, the yellow LED die is covered with a clear layer of silicone. Since the silicon dome known from other high power LEDs is missing, from the side the LED looks very flat, like Black Flat or XP-L HI. Here is the unique footprint of the SYNIOS. This is the same for all SYNIOS P2720 sold. The bigger area is the cathode and ensures heat dissipation. The smaller area is the anode and doesn’t fulfills further tasks. For this test I soldered this LED on a well known Noctigon XP20 DTP copper board, with the cathode on the central thermal pad (like Black Flat). The emitter doesn’t seat itself, and it is strong recommended not using too much solder paste that squeezes out sideways in reflow procedure. Important: if doing so, the cathode is NOT electrically isolated to the flashlight body / heatsink and requires that the board OR the driver electronic is electrically insulated from the heatsink or flashlight body! 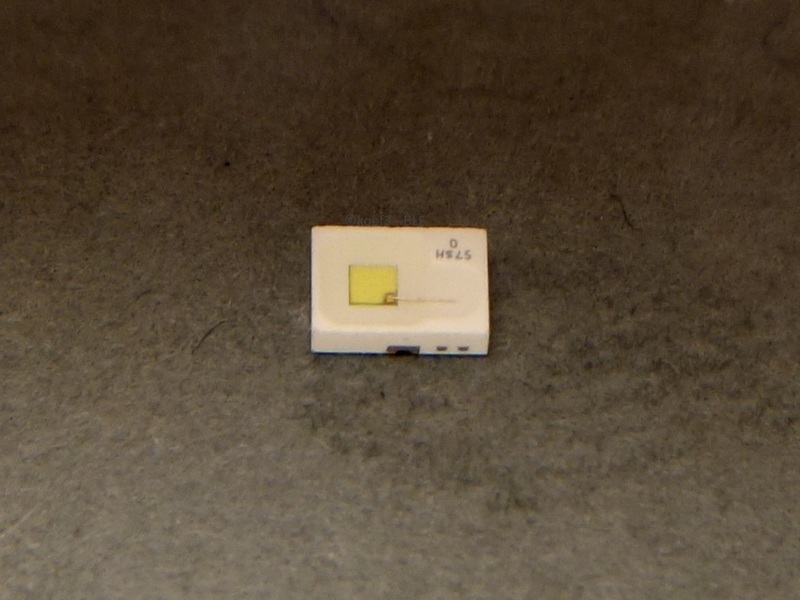 Like the SYNIOS DMLN31.SG previously tested the light emitting surface is very small. One corner appears like „bitten off“, which reduces the die size considerably and increases the luminance. There is also a white area around the die. This area could affect the luminance and therefore the maximum throw in a negative manner. The total light emitting surface area (LES) is 0.503 mm² (0.00078 sq in) in size. According to my measurement the manufacturers specs ('1/2 mm2 chip size class' named in datasheet introduction) are exactly match. The color consistency is good at all, other colored surfaces next to the white LED chip doesn't exist. In the diagram I compare this LED with the XP-E2 and XP-E2 Torch dedomed. Like the SYNIOS P2720 DMLN31.SG the relative luminous flux from 25 to 85 °C Tsp decreases only in 3 percent, unless other LEDs with 9 to 15 percent. The Vf is much lower than of the XP-E2. The maximum power of this SYNIOS is limited by it's thermal resistance, more than 9 watts aren't possible - a problem which limits the XP-E2 (typ. 9.0 K/W) in its performance too. In comparison the Black Flat with only typ. 3.0 K/W can deliver about 20 watts, at approx. 930 lumens. 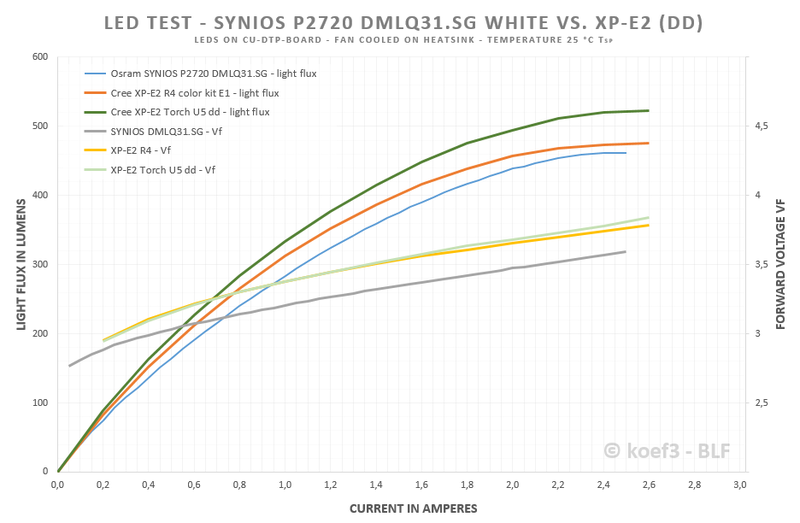 The SYNIOS is a good and efficient replacement for XP-E2, if the very high luminance is needed or desired - the efficiency is almost the same compared to the XP-E2, even in dedomed state (Torch)! If the white areas around the die are covered with opaque material, the light flux is around 40 to 50 % lower! The luminance of the DMLQ31.SG equals to the XP-G2 S4 2B, but at much lower current (and therefore longer runtimes), so this LED might be a very good option for pocket throwers which are limited in the possible battery configuration (10440, 14500). In addition, there is no longer need to dedome this LED. As part of this test, I didn’t test the behavior in optics. 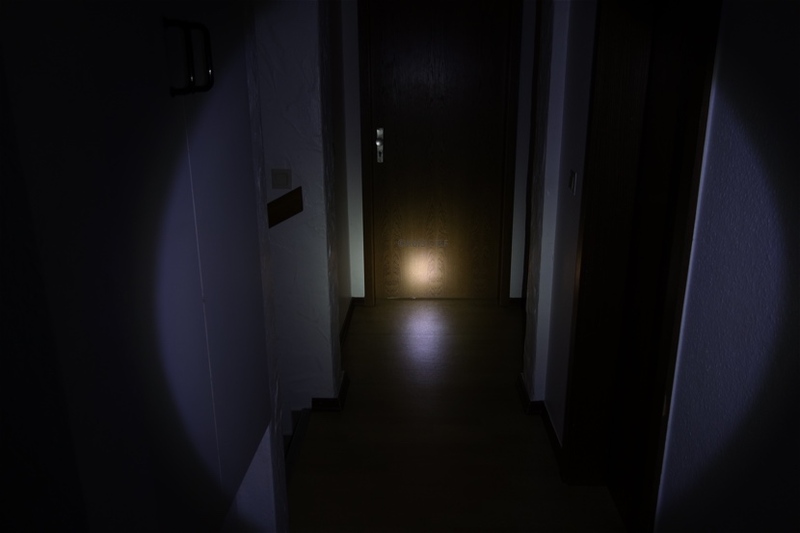 But because of the strong similarities to the other SYNIOS LED (for more details of this flashlight please click link, german) the light pattern and behavior with optics (TIR/reflector) should be the same. The quality of optics (especially of aspheric lenses!) must as good as possible, otherwise artifacts in the light pattern (rings, dark areas) can occur due to the extremely small chip size. Unfortunately the white surroundings around the die inflates the first measured luminance and lowers the maximum throw possible. The light color is a clear white without much blue, different to the picture above. I estimate the CRI not higher than 65 – 70, the colors aren’t reproduced good as well which is normal for cool white light sources in this color rendering class. If the white area around the die is covered with opaque material the tint shifts heavily to blue, at over CCT 10000 K! For performance in light flux and luminance, this LED could be the little sister of the good old dedomed XP-G2 S4. Almost the same luminance, but at much lower current makes this LED a good option for all those who build a pocket thrower where long runtimes and cooler head are preferred. In addition, there's no longer need the dedome this LED before using. 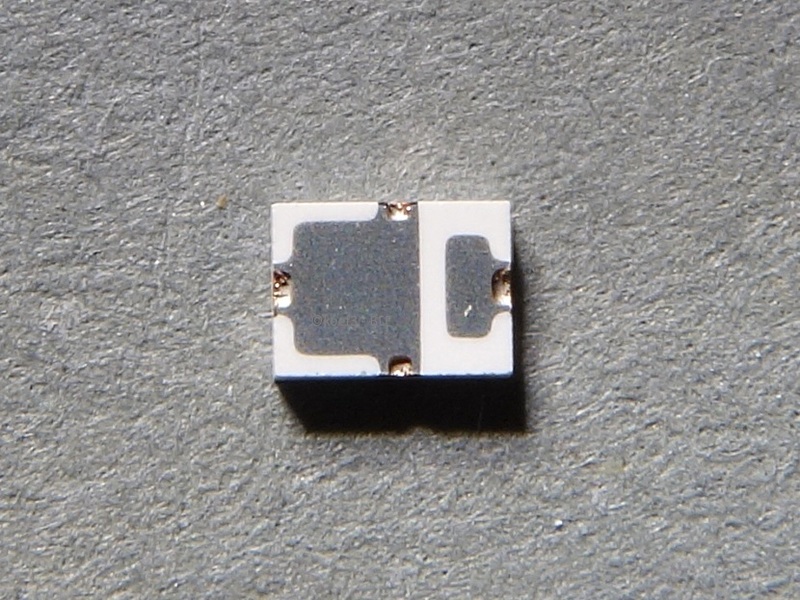 Unfortunately this LED owns a special footprint, is very small in size which makes the handling more difficult and the maximum power is limited by the thermal resistance which isn't so good as of other LEDs in same power rating. 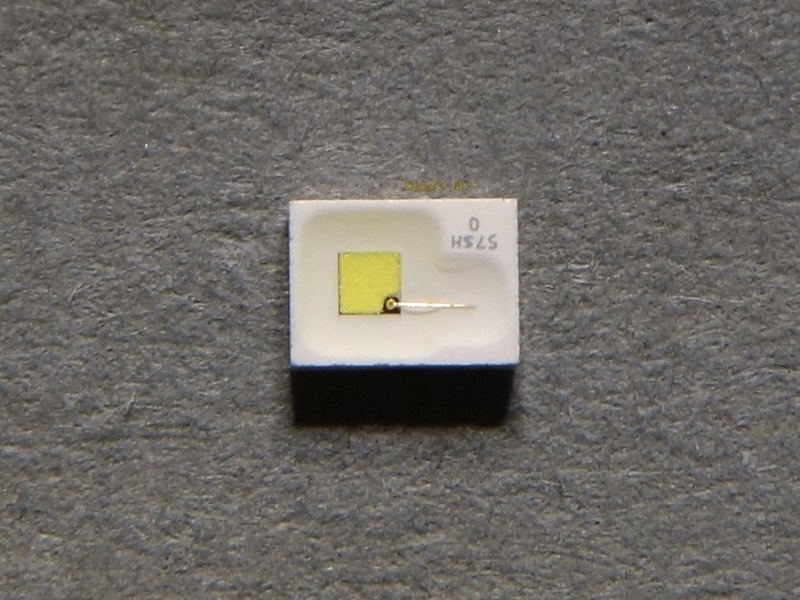 But if you like cool white colors and big throw even at low power, this LED could be the right choice for you! Thanks a lot for reading and thanks to be now part of the BLF community! Thanks for joining us koef3. Thanks for great test on led. Welcome to BLF. Yay I was waiting for this! I’m gonna buy some and see how much more cd/mm^2 I can get with the cooling I use. When you reflow it onto an XP board, the large LED pad goes on the center PCB pad and the negative PCB pad is left empty. The result is that the emitting square of the LED is perfectly centered on the MCPCB. The whole rectangle looks off center but the die isn’t. where can i buy this killer LED? Both the DMLQ and DMLN are available from mouser. I always order in sets of 10 in case I fry one or damage it when trying to reflow. There is a price break at 10 units. May not be the best choice if you’re on a budget, maybe just buy 2 or 3. Koef3, do you think a bit higher throw performance and warmer tint could be obtained if dedoming? It seems the silicone layer on the die is really thin, but a warmer tint would be worth it. Very cool led, thanks for the test! I think I will get me both versions now and see how I can make them work in a flashlight. 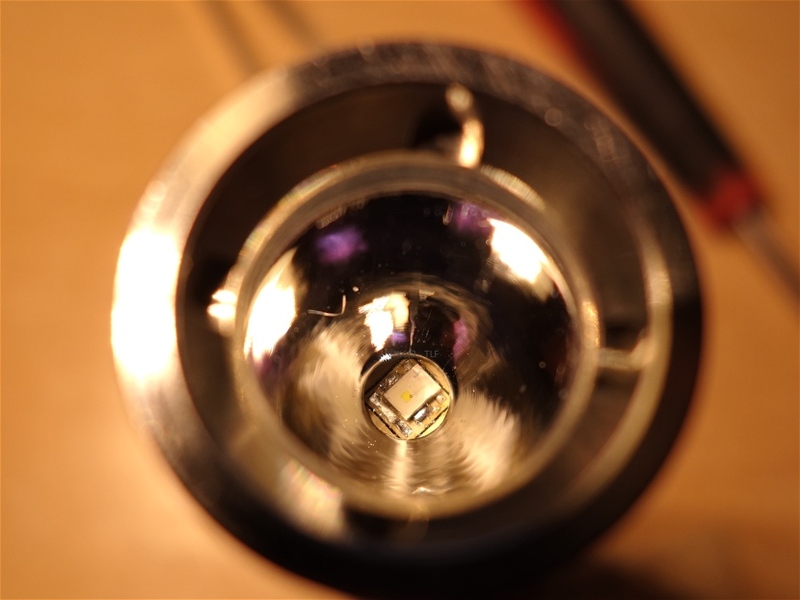 In the past the phosphor layer of most Osram is more like a paste and not really solid as we know from other LEDs (Cree XP-G2, XM-L2). If it is dedomed in chemical way the phosphor came off the die too. I didn’t try a dedoming of the SYNIOS myself. Since the SYNIOS is dedomed already, I don’t think that a higher throw performance (or luminance) can be obtained. But as I said, I didn’t test this, and my samples available are needed for a SYNIOS compilation test with comparison of all types. Interesting on the other hand is the light color. If I mix the light of my DMLN31.SG sample up (in ceiling bounce or wirh diffusor) the color changes from white with some blue to a really nice cool white with a little bit rosy or red in it. Has anybody told luminarium iaculator about this? Ooh, i want to try this too. Great news, thanks for another comprehensive test! Of course my tests are a lot less scientific than yours so i’ll probably try reflowing a few more another day and testing them again directly against the DMLN. I wouldn’t be surprised though if the smaller LED gets higher intensity because of less heat. That would make more sense, since other than the die size they’re the exact same LED type and manufacturing. I am stuck with old XP-G2 S4 2B but who knows what future brings. A couple mods with this LED have been done and the measured in-flashlight candela values were slightly below the dedomed XPG2. The picture above of the lit LED and of djozz’s aspheric lens beamshot show that there is significant light coming from the areas to the side of the die. This extra light could artificially inflate the calculated luminance value (315cd/mm^2). Maybe this is not the intensity king after all. I haven’t done any lux readings but experienced a similar thing myself in the build I am working on. 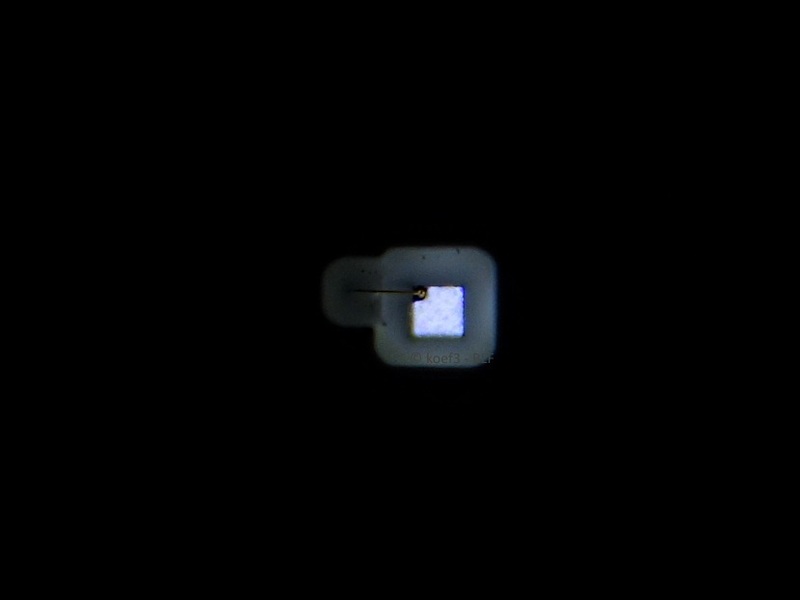 A small spot (the die projection) surrounded by a lot of extra light, coming from the white area around the LED. It did not look any more intense (when in the light) than a black flat, although I haven’t had the chance to compare them side by side. I covered the white areas with aluminium foil (I tested black paper and tape but that melting away directly on the die). I checked very carefully if the foil covers precisely the white area and not the die itself. I placed the luxmeter 1 m away from the LED, like my earlier tests. 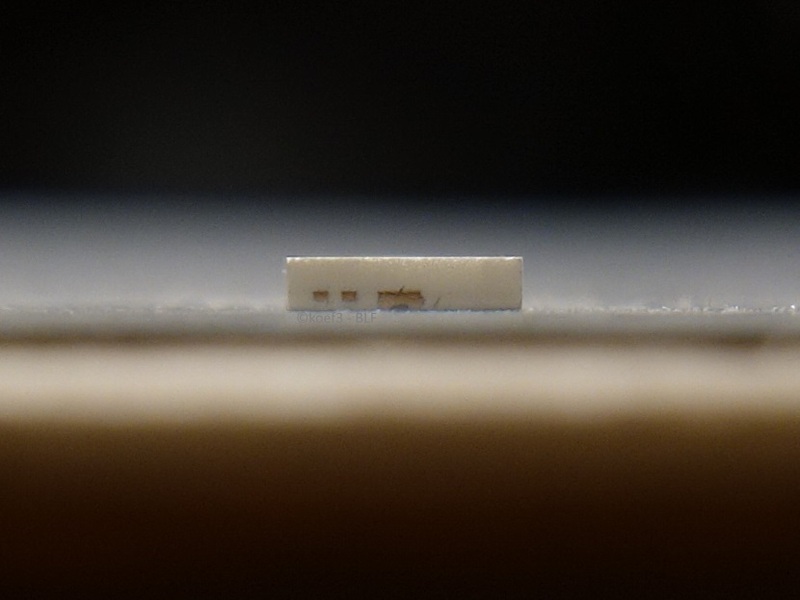 For the so modified SYNIOS I got 216.7 cd/mm² at 2,500 mA (101.4 cd/mm² at 700 mA). Much less than I measured in the test, but still not bad for such a low current and therefore battery drain. Enderman, thanks a lot for this very important hint and for everyone who did some real-life tests with this LED to explain what I may have wrong in this test. I always learning a bit more, especially in doing such LED reviews. It’s very unfortunate that you started doing these luminance measurements just as these new LEDs started appearing. This LEDs are on sale at least for over two and a half years (begin mass prod. Apr 15). I don't know if these emitters were already mentioned in flashlight forums. Maybe it is better that other members doing these luminance measurements. In most cases my values seems to be wrong. I am not sure to take newly this risk for updating the luminance values because they could also be wrong for any reason. Well yes, but we didn’t know about them. I think you should continue ;). This LEDs are on sale at least for over two and a half years (begin mass prod. Apr 15). I don’t know if these emitters were already mentioned in flashlight forums. As the frontier of luminance testing you stumble upon problems. That’s expected. Please don’t give up, luminance is just as important as total output. Both me and koef made the same mistake when measuring the synios. I only found out that we had a flaw in our testing method after three people used synios LEDs and got bad results in their flashlights. Actually many LEDs will have a problem with this method of calculating luminance. Any light that you see not coming from the die itself will inflate the calculated luminance. To name a few: XPG3, XPL2, luxeon V, nichia 219C, XHP50.2, XHP70.2. That being said I find koef3’s detailed pictures and measurements to be very useful. 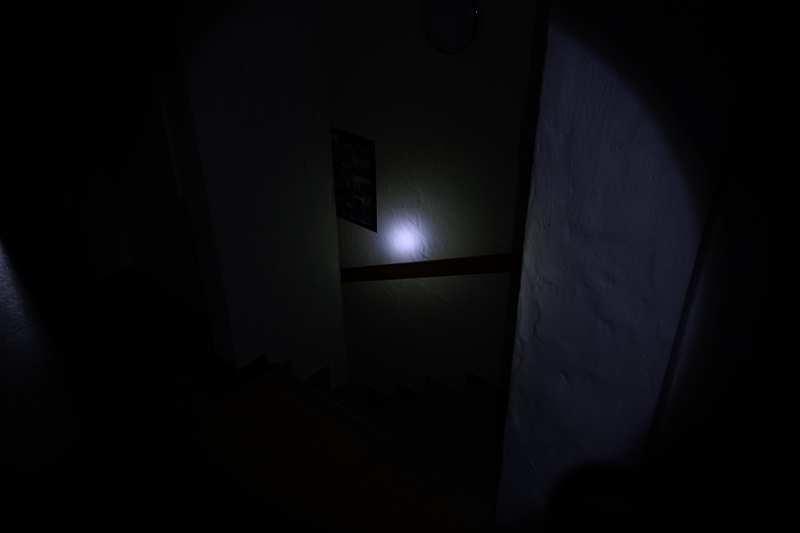 But for the luminance measurement I think a careful in-flashlight test will give a more accurate result. Koef3 tests are very very good. Final word about the certain led should be given in practical use. It can have all numbers in a world but when I “throw it” to light meter that is truly real state of matter. Are you sure about the 219C?